You are here: Home / News / Environmental Performance Index (EPI): does Belgium have Europe's worst air quality? Environmental Performance Index (EPI): does Belgium have Europe's worst air quality? Every two years the University of Yale publishes the “Environmental Performance Index”, in short the EPI. The publication of the EPI coincides with the “World Economic Forum”. For every country, different indicators are calculated based on several high-priority environmental issues to provide an overview of the environmental performance. The EPI framework consists of 9 issues and more than 20 indicators. The EPI ranks the performance of countries in these environmental issues according to their acquired score to inform decision-making. Regarding all environmental aspects, Belgium reached a global score of 80.15% resulting in the 41th place (of 180 countries) in the 2016 ranking. This is a slight drop relative to the 2014 ranking in which Belgium was ranked 36th (of 178 countries). Nevertheless, Belgium’s global score improved considerably, since it totalled only 66.6% in 2014. Belgium scores especially poorly concerning the environmental issue of “Air Quality”. With a score of 60.9%, Belgium finished 162nd on the global ranking list. When focusing on its position among the other European countries, Belgium even finishes last (http://epi.yale.edu/issue/air-quality). This poor result was picked up by Belgian media (in fact, wrongly as “Belgium has the second worst air quality within the EU“). This result reported by YALE is however a surprise to Belgian air quality experts. For this reason, the methodology is analysed more in depth. The most dominant indicator causing Belgium’s low air quality score is the “population averaged spatial mean of PM2.5 concentrations” or average population exposure to PM2.5. To calculate this average PM2.5 exposure for all countries a global dataset based on “Aerosol Optical Depth” (AOD) is used. This technique using satellite data has the benefit of a worldwide coverage, while ground data of PM2.5 are not available everywhere. The disadvantage of the technique is the indirect methodology to retrieve PM2.5 concentrations from AOD measurements. The AOD parameter should be validated with PM2.5 ground data, which is not straightforward. Satellites currently used for AOD are not geostationary, but satellites which fly in a lower orbit viewing the same location only once a day, while making a scan for a ground surface of several km². Another restriction is cloud cover, which prevents AOD measurements. The European Environment Agency (EEA) also provides data on population averaged spatial mean of PM2.5 concentrations for every EU country. These data are based on PM2.5 ground measurements performed by every single European member states (in case of Belgium, these data are provided by IRCEL). These data provide a significantly higher reliability compared to data indirectly calculated trough the AOD technique used by the EPI. As shown in the graph below, the 2012 average PM2.5 exposure reported by EEA (X-axis) are plotted against the recent YALE (Y-axis) data. The YALE data clearly underestimates several East-European countries. In general, YALE’s data underestimates all the values of all countries, including lower estimates. 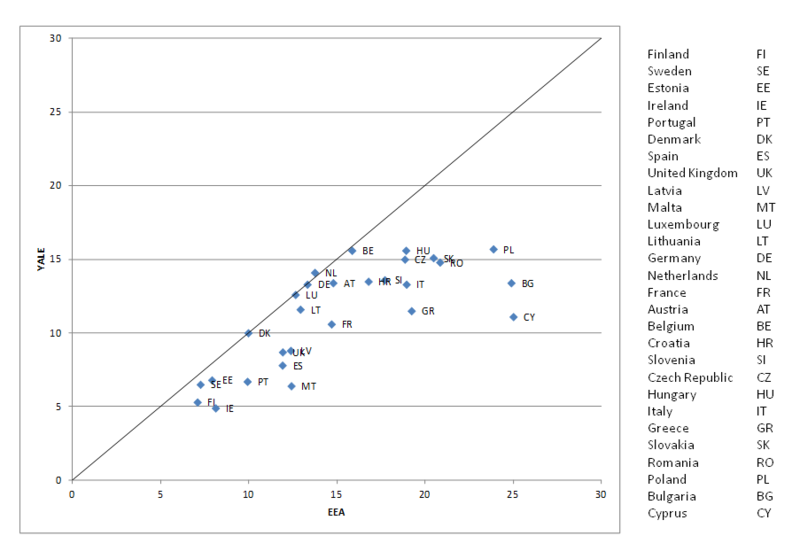 YALE’s calculated concentration for Belgium corresponds well with the EEA value, which is the highest of all West-European countries (as expected). However, since the concentration of East-European countries is clearly underestimated by YALE, Belgium is ranked unrealistically poorly. The original authors of the used satellite data (van Donkelaar A., Dalhousie University) did however signal the underestimated PM2.5 concentration in e.g. the south of Poland due to high cloud cover during winter months. As a result, high PM concentrations typical for winter were not detected by the satellite. This important nuance was not explained by YALE. Average PM2.5 exposure for EU countries (annual mean in µg/m³, 2012). Comparison between EEA (x-axis) and YALE (y-axis) data. For the air quality ranking of YALE, also the NO2 yearly mean concentration is used as an indicator. Here, Belgium received a score of 0/100, just as the Netherlands. Together with the Randstad area in the Netherlands and the Ruhr district in Germany, Belgium (north of the Sambre and Meuse valley) is a part of one of Europe’s NO2 hotspots. The NO2 threshold used by YALE is 12.6 µg/m³, corresponding with the 99th percentile globally. All countries with an average NO2 exposure higher than this threshold receive a score of 0/100. This measure is rather strict since the World Health Organization (WHO) uses a threshold of 20 µg/m³ for impact estimations in its HRAPIE report. The NO2 indicator weighs less (only 10%) compared to the PM2.5 indicator within the total air quality score. It is however questionable why the 99th percentile is used for NO2, and not the health based guideline values from the WHO as is the case for PM2.5. According to the latest air quality report from the European Environmental Agency (http://www.eea.europa.eu//publications/air-quality-in-europe-2015) Belgium is ranked 15th (of the 28 EU countries) taking annual mean PM2.5 as indicator. The annual mean PM2.5 concentration is lower than 20 µg/m³, the indicative target value to be attained by 2020 in accordance with the European guideline 2008/50/EG. In the south of Belgium (south of Sambre and Meuse valley) also the stricter WGO guidance value of 10 µg/m³ is obtained in several monitoring sites. When conducting a ranking based on average PM2.5 exposure according to this ranking, Belgium is lranked 17th (of 28 EU countries). In the recently published annual air quality report (2014) by IRCEL, air quality shows considerable improvements in the past decades. More info: http://www.irceline.be/nl/documentatie/publicaties/jaarrapporten/jaarrapport-luchtkwaliteit-in-belgie-2014/view (dutch) and http://www.irceline.be/fr/documentation/publications/annual-reports/rapport-annuel-2014/view (french). In 2015 the European daily limit value for PM10 was exceeded nowhere for the fist time since the start of PM measurements in 2005: nowhere in Belgium an exceedence of PM10 daily mean higher than 50 µg/m³ occurred more than 35 days a year. PM10 is particulate matter with a diameter of less than 10 µm. Based on the best and most representative available data, we can conclude that Belgium does not have the worst air quality within Europe. Air quality has improved in recent years and Belgium was in compliant with the European limit values for PM (PM10 and PM2.5) in 2015. The concentrations of particulate matter, however, still exceed the more stringent guideline values of the World Health Organization in most monitoring sites. Also NO2 concentrations remain high along several ring roads and highways and in streets of the inner cities with a high traffic density. The European annual limit value of 40 µg NO2/m³ (same as the WHO guideline value) is still exceeded. The most important cause for this are the nitrogen oxides (NOx) emissions by diesel cars. These emissions are substantially higher during real driving conditions compared to what is allowed by the European legislation (EURO standards). Air pollution in Belgium still has a significant negative impact on health. Additional emission reduction measures at the local, regional and European level are desirable to further improve air quality and lower the impact on health.